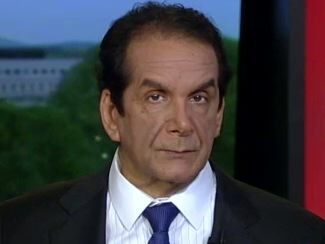 Krauthammer On Drones Flying In US: "Stop It Here, Stop It Now"
"I'm going to go hard left on you here, I'm going ACLU," syndicated columnist Charles Krauthammer said in opposition to the use of drones on the U.S. homeland. "I don't want regulations, I don't want restrictions, I want a ban on this. Drones are instruments of war. The Founders had a great aversion to any instruments of war, the use of the military inside even the United States. It didn't like standing armies, it has all kinds of statutes of using the army in the country." "I would say the price of liberty. You can hear a helicopter, you can't hear a drone. You know, if you hear a helicopter you hide under a bush. Well, you can't with this which is why it's effective in Pakistan and elsewhere. It's deft and it's silent. I don't think we want a society where if there are the objects, hovering over streaming, real-time information about you, your family, your car, your location," Krauthammer said later in the segment. "It's not worth it," he said. "The Founders we're deeply opposed to the militarization of civil society. There is all kinds of aversions to it and this is importing it because, as you say, it's cheap, it's easy, it's silent. It's something that you can easily deploy. It's going to be, I think the bane of our existence. Stop it here, stop it now," Krauthammer said at the end of the panel segment. "Strong letter to follow." Obama: "Question Is Not Whether Things Will Get Better, They Always Do"
Obama To College Women: "You Can Be Stylish And Powerful"